While I’ve been highly critical of the front office I would be remise if I didn’t point out when they do something right. Surely they’ve made some of the most asinine moves/trades that I’ve ever seen from people that are supposed to be hailed as geniuses. However that doesn’t mean that they haven’t made their share of good moves as well. I like the David Freese trade and I’ll tell you why. The Dodgers picked up two veteran players at the August 31 waiver trade deadline this season. One of those players is infielder David Freese. The Dodgers traded minor league infielder Jesus Valdez to the Pittsburgh Pirates for Freese in a one for one swap. Freese, a 32-year old former World Series hero has settled into a part time role as his career winds down. He’s played in just 94 games this season and tallied 265 plate appearances during his tenure with the Bucs this season. Overall in 2018 he’s slashed .282/.336/.444 with nine home runs, 42 runs batted in and a .113 OPS+. Freese has been a remarkably consistent player over his ten-year major league career. He’s a career .274 batter with a .347 on-base percentage. He’s averaged at least 15 home runs per season and has only had two seasons where he’s recorded a below average offensive campaign. That’s come out to a 109 OPS+ and if you’re looking at WAR, he’s accumulated over 15, including two wins last season and 1.5 wins this season. This acquisition might even increase the Dodger’s odds of advancing deep into the postseason. He’s hit left handed pitching pretty well in 2018 too. The Dodgers are reportedly going to use him as a late inning pinch-hitter off the bench and possibly give him time at first base against tough southpaws occasionally. I would be fine if Freese got some reps at first, considering the Dodgers have inexplicably given up on Max Muncy and his 30 home runs. Cody Bellinger looks destined to get more time in center field than at first base the rest of the way anyways. The reason why I like this move is not only because Freese is a solid player and proven postseason performer, but also because having that extra hitter with postseason/World Series experience can make a difference. Sometimes one plate appearance or at-bat can have a huge impact on a playoff series or stretch drive. I’ll give you an example. In 2016 the Dodgers traded fan favorite A.J. Ellis to the Phillies for Carlos Ruiz. It was essentially a swap of backup catchers and most Dodger fans hated the trade. The fact was that Ellis wasn’t hitting and the Phillies were in their rebuilding phase, dumping expensive veterans. I hated to see Ellis go, but the trade made sense. It also paid off for the Dodgers. While Ruiz didn’t do much during the regular season, he certainly became a factor during the playoffs. Ruiz had two key hits in the Dodger’s playoff run that season. Both came in the NLDS against Washington. One was a pinch-hit home run in a game the Dodgers lost. The other was a massively clutch pinch-hit RBI single in that decisive game 5 that gave the Dodgers the lead. Had Ruiz not gotten that late inning hit the Dodgers may not have won that game. Those two hits were important for the Dodgers. Was it worth trading away a backup catcher in decline that wasn’t going to hit anyways? For those potentially game changing hits, in my opinion it was. 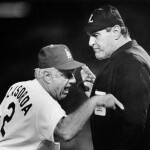 The same type of thing might happen with Freese. 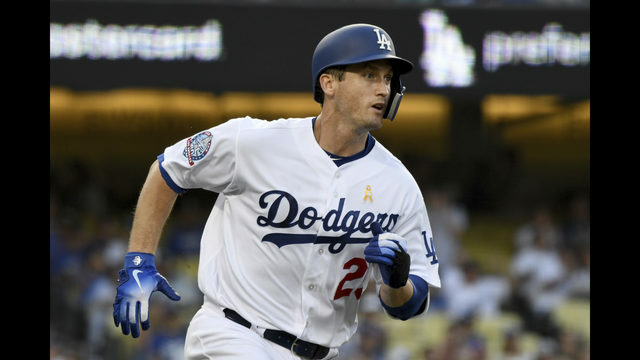 If David Freese comes off the bench in a playoff game for the Dodgers and gets a clutch hit with runners on base then you’ll understand why the Dodgers acquired him. Oh and hey he also reached base twice and got a hit in his first start on Saturday night in the Dodger’s 3-2 victory over the Dbacks. Then he followed that with two hits including a home run and a terrific defensive play on Tuesday night in the Dodger’s 11-4 win over the Mets. Check it out. I do not think there is a poster on here who has not questioned the FAZMASTERS trades at some point. And as Scott pointed out, for guys supposed to be genius’s they have not gotten to the promised land yet. Close, no cigar. I like Freese. Always have, even though I was pulling for the Rangers when the Cards took them down, nobody could not say the guy was not clutch. Also, he is a smart baseball player. He coached Puig while running the bases. To me he is a far more valuable pick up than Granderson was last year. Grandy hit some key homers early and then like Reddick, totally disappeared. And last year, they really did not need Granderson, they were cruising. Had Cody not tweaked his ankle, I do not think they even make that deal. But the 10 day DL stint put a little strain on the offense. Grandal at that point was in a huge tailspin. What irks me most is the fact that a huge hole was created in the bullpen when Morrow left. They sign Koehler and that was it. All the other pitchers signed were reclamation projects or mediocrity waiting to happen. They have not had a solid # 2 since Greinke left, and with Kershaw being injury prone the last couple of years, they really needed that guy. Wood stepped up last year and regressed some this year. Hill has not been that guy, he is hugely inconsistent most of the time, and gives up some key HR’s, something that has bit the entire staff this year. So when you look at the stats and see they are 1st in the league in ERA, it is hard to fathom because they have lost so many close games. And therein is the kicker. Last year, they won those games. This year, with little or no clutch hitting late, they are losing those games. 22 left. Not much time. Everyone who was saying they would kick it in gear and win it going away are being proved wrong. The Rockies and the D-Backs are not going to just lie down and give up. The Dodgers are in the biggest fight they have been in for years. Do they have the grit to get it done? We will see. Somebody is going to have to really light the fire. 22 games left but I think only 6 at home. I think Freese was needed because CT3 has regressed to the player Seattle saw on a regular basis. Freese is a nice pick up. I have no idea if he is a good 1B but he is definitely better than Muncy. That guy is pretty bad with the glove. But when has FAZ cared about defense? Howie Kendrick in LF!